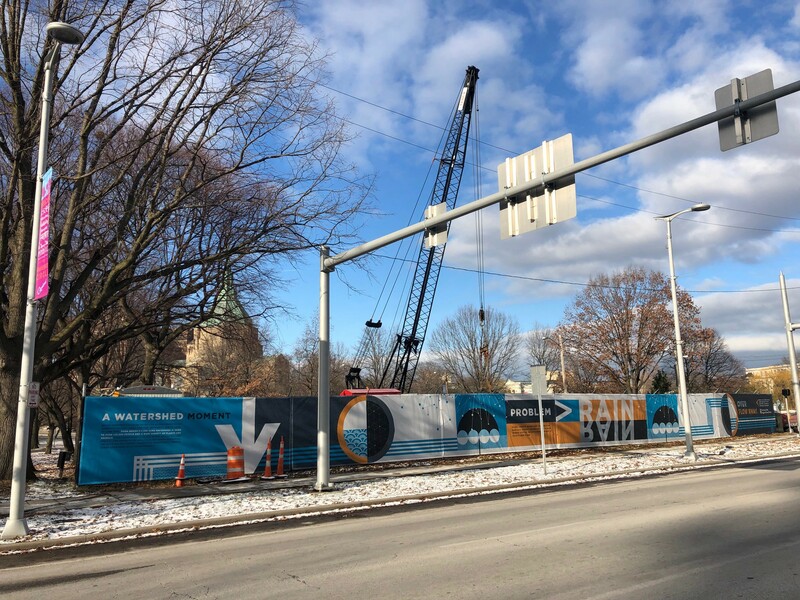 New banners line the fences of our Doan Valley Tunnel project, part of a Public Art strategy to create and better communicate in neighborhoods affected by our Project Clean Lake construction. Photo courtesy shark&minnow. Construction signage often gets a bad rap. But one of our current projects has a new wrap as a sign of better things to come. 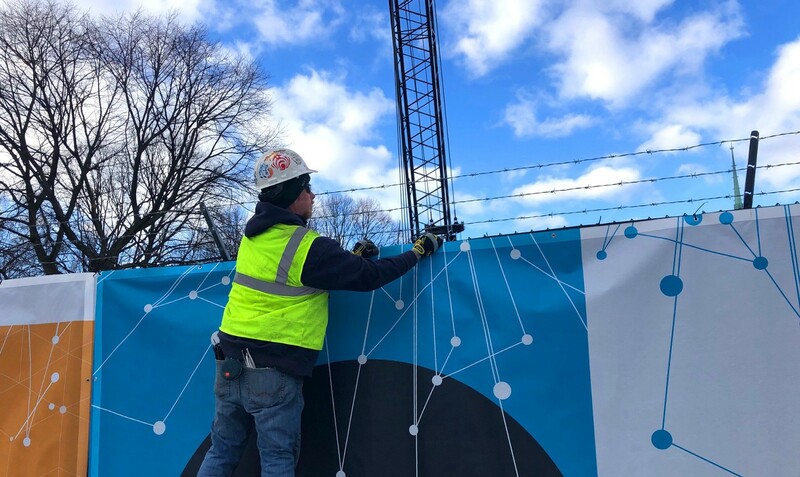 Fences surrounding our Doan Valley Tunnel construction sites in University Circle were recently wrapped with stylized educational graphics, thanks to a new public art initiative within our Project Clean Lake construction efforts. Working with local designers, we aim to educate and make personal connections between residents and their neighborhoods during construction — and long after. 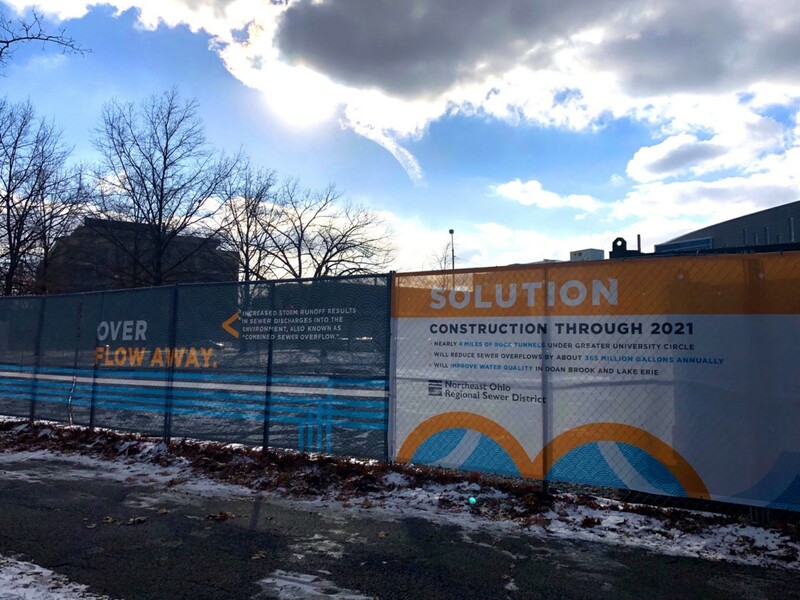 Close work with LAND Studio, Trust for Public Land, and neighborhood stakeholders resulted in over 400 feet of construction fence banners at three sites along MLK Jr. Drive that communicate both the underground work and above-ground impact. Local firm shark&minnow designed the banners, with partner input. The banners around our Doan Valley Tunnel sites will remain up during tunnel construction. This work is part of our larger public art strategy, focused on Project Clean Lake construction-project opportunities to create and educate in collaboration with local artists. While this is currently the most visible installation, others are taking shape this year, including one near the intersection of Buckeye and Woodhill Roads, featuring stormwater-control measures and designs by local artists. “The Sewer District has an interest in Public Art being able to spark curiosity and raise public awareness about water quality and clean-water stewardship,” said Senior Communications Specialist Michael Uva, who has facilitated the District’s development of a Public Art strategy.